Every idea sounds great in your head. Same goes for programming ideas. 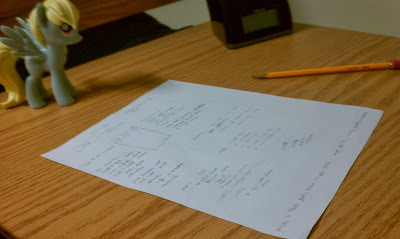 It turns out when you write out how you plan to code a game on paper, you find lots of flaws when you try to connect the pieces. Over time you get better and find less of them, but the fact still stands. You should scribble out your programming logic before diving into an editor and start typing. It's good to have a little logic chart around anyway. If you make a mess with actual code, it's much more hazardous to fix. I learned the hard way from TriGrid that deleting one useless script does more harm than good and makes fixing whatever missing link you made a black hole for development.